The theater audience erupted in shocked delight when Eraste brought her out of her carrier and the squirming piglet went after a piece of celery on his costume. 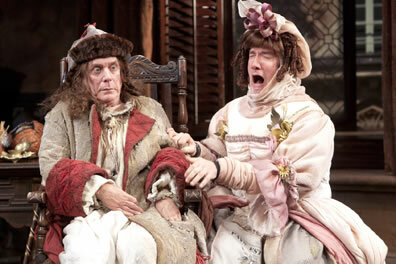 Floyd King, left, plays Geronte, beset by people angling for his inheritance, while servant Crispin (Carson Elrod) works him disguised as Geronte's niece, a pig farmer, in the Shakespeare Theatre Company's production of The Heir Apparent. Photos courtesy of the Shakespeare Theatre Company. That old theater saying that actors should never share the stage with a live horse, dog, or small children does not mention pigs. After the performance of Cordelia the piglet in this production, swine can still be exempted from the standard. But, then, Cordelia, said a stagehand in a post-show discussion with the cast, was literally born into show business. Her mother had briefly starred in a production of Oklahoma at Arena Stage, and Cordelia was just two weeks old when she won the part in The Heir Apparent. She literally grew into the role. And it is a starring moment, albeit brief. The plotters—nephew Eraste, his love Isabelle, and his servant Crispin—angling for old Geronte’s inheritance try to dissuade him from leaving any of his wealth to a previously unknown niece who operates a pig farm in the country. 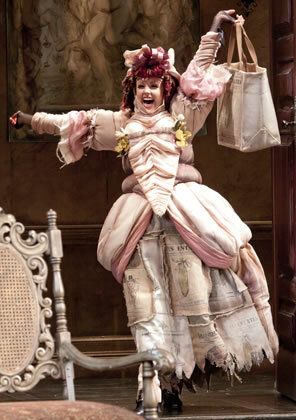 First Crispin came on disguised as this niece, dressed to resemble a pig and proffering a bag full of pork products (bacon, pork rinds, salami, and ham). Isabelle, not knowing of Crispin’s efforts, appeared as the niece, too. Her pig-like costume included a twirling tail, and she bore gifts of pigs feet, hocks, and chops. Then came Eraste, also oblivious to the fraudulent nieces already there. His costume was that of a nursing pig plus a pig nose, and the gift he proffered was a living pig (Cordelia). The theater audience erupted in shocked delight when Eraste brought her out of her carrier and the squirming piglet went after a piece of celery on his costume. The answer: not quite, pig and all. This play in structure, verse, and performance was not quite up to those of The Liar, where everything from the script’s rhyming witticisms to the actors’ ability to make the most absurd verses and movements seem not just natural but proper remain as laugh-out-loud funny today in recollection as the night we saw it in person. But The Liar set such a high bar that to say The Heir Apparent wasn’t as much fun is not to say it wasn’t good fun in its own right, for this production did give us a great night of theater, with or without the pig. Meg Chambers Steedle as Isabelle disguised as the pig farmer. In a solid corps of actors skilled in physical comedy, Carson Elrod did the heaviest lifting as Crispin, playing himself and disguised, in addition to the pig farmer, as a Tennessee nephew from New York and as Geronte. Thinking the old miser dead, Crispin masqueraded as Geronte to dictate his will to the lawyer, Scruple. “Well, I don’t care what anybody says,” Crispin said as he took off Geronte’s clothes at the end of this particular charade, “I am a one-man Comedia Francaise!” and the audience responded with applause. The highlight of that masquerade, though, was the real Geronte, played by Shakespearean clownster Floyd King, appearing in a daze and ending up in Crispin’s lap, forcing Crispin to manipulate the old man like a puppet. King, in fact, outscored Cordelia on the laugh meter when his supposedly dead Geronte wandered onto the stage behind the unawares conspirators doing a mock conjuration of Geronte’s spirit. Because we as the audience believed the maid Lisette, who reported Geronte dead (as she thought he was), this moment, capped by King’s glazed expression as he stumbled back and forth across the stage, was this play's faux swordfight moment, a la The Liar. Kelly Hutchinson as the nagging and manipulative maid Lisette choreographed the others’ activities with a constant flush of expressions and emotions (flush being the operative word here as toilet humor was central to the plot and a constant source for jokes, especially hers). Nancy Robinette played old Madam Argante as a viciously scheming predecessor to Lady Bracknell. And Meg Chambers Steedle as her daughter, Isabelle, was a stunning beauty who put aside her good looks to engage in all manner of physical antics, including playing a pig-like woman. Trying to maintain a prim and proper carriage, she would let out full-throated, spasmodic screams at every shocking moment she encountered, whether it was seeing a very-much-alive Geronte she thought was dead (this happened twice) or turning around to discover another pig-like niece already in the room. Bravely playing Scruple was Clark Middleton. An actor of short stature, he not only had to put up with a constant stream of short jokes, but also had to enter this play in the second act when mayhem and an esprit de corps were already well established by the rest of the cast. That esprit de corps proved to be an important element of the night’s entertainment. Even as their characters were struggling with each obstacle to their goal of becoming Geronte’s heirs, it was apparent the actors were clearly enjoying themselves, each other, and the play itself. Seldom have we seen every member return to the stage for a talk-back session with the audience as this cast did. All except Cordelia; she was no doubt getting her rest and saving her voice back at her apartment.